JOIN US for our 5th Annual 5K/10K Run for the Wounded on May 19, 2018! THANK YOU to everyone who helped make our 5th Annual Run for the Wounded such a HUGE success! With your support, we raised $80,000 towards our Veterans Village Initiative!! Join the Nine Line Foundation and Nine Line Apparel every Armed Forces Day for our Annual 5K/10K Run for the Wounded here in Savannah, Georgia. Proceeds from the race will go directly towards our newest initiative: building a transitional community, a Veterans Village, for homeless veterans right here in Savannah, Georgia. With both 5K and 10K options available, this twilight run is great for any participant. Participants will receive a post race beer from local, veteran-owned Service Brewing Company (participants age 21+ only), a Nine Line Apparel designed Event T-shirt, koozie, and special edition 5K/10K challenge coin. Thank you to everyone who contributed to our collection for the homeless here in Savannah! Thanks to you, we’ll be making a significant contribution of canned and dry goods, toiletries, and basic essentials to the underprivileged in our community! Click here to view the 5th Annual Run for the Wounded Race Reults! 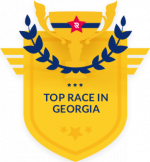 We are proud to have been named one of the top races in Georgia! Click here to view the Photo Backdrop snapshots, courtesy of South Magazine! Thank you to everyone who participated in our 4th Annual 5k/10k Run for the Wounded! On Saturday May 20th, 2017, hundreds of people went the extra mile to help Marine Corps veteran SGT Eric Morante. SGT Morante lost one of his legs in Iraq in April 2007. Through the 5k/10k Run for the Wounded, the runners raised $65,000 for SGT Morante. This money was used to build a handicap accessible home for Eric, his son, and his mother in Texas, which was completed on March 3, 2018.